Joseph Edwards Creator and Owner Edward Neary LOVES weddings!! Edward lives for weddings, in fact, the first time he picked up a video camera and filmed a wedding he knew that this was his true calling. Aiming to capture the very soul of a celebration, and dissatisfied with the artificial, glaring quality of standard wedding videos, the self-taught videographer spent years honing his original techniques that create the look and feel of the high-budget films we see today, with the same natural energy, realistic lighting, creative flow, and – most importantly – authentic, evocative expression. Neary’s innovative methods, impassioned style and exuberance for his work have earned him international acclaim, along with deep gratitude from a wide range of delighted clients – clients who treasure the memories he captures so eloquently on film. Cutting-edge equipment – some of which is the same equipment used in big-budget films and television shows today – frequent lens and perspective changes, imaginative but unobtrusive shooting and sleek, inventive editing allow us to create the fluid eloquence found only in major motion pictures. We’re all about the shot and will do anything to get it… even if it means shooting from a moving car, a helicopter, or underwater! Whether it’s an elaborate ballroom affair, a simple barefoot event on the beach, or a paparazzi-filled celebrity wedding, we offer a stunning array of film styles – from Super 8 nostalgic, to modern minimalist, to uber-romantic – to create a film whose sheer magic inspires and transports, and can be enjoyed by generations forever. 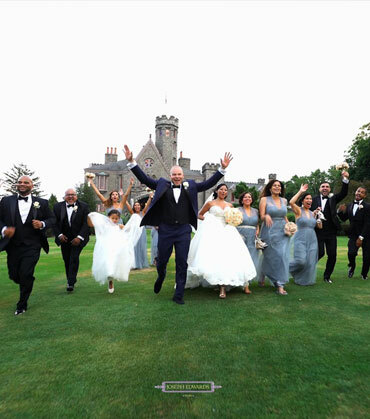 As a boutique wedding cinematography company, Edward guarantees quick, thoughtful and attentive service. What does that mean to you? Edward promptly replies to your emails, calls, and requests for assistance. If you need to make tweaks or more involved edits after you receive your trailer or film we are glad to assist. Edwards promise to you… Joseph Edwards Films is with you every step of the way until you are 1000% happy with the outcome of your online trailer and wedding film. Joseph Edwards provides event videography in New York, Long Island, Westchester, Connecticut and destinations around the globe, and are available for a variety of events, from weddings to Bar and Bat Mitzvahs, to anniversary and birthday parties, to non-profit, corporate and celebrity events. Samples of our work can be viewed in The Screening Room – so sit back and enjoy! Thank you for visiting our site – and we look forward to meeting you in person and making your memories!